Looks like Jack Asteroid is getting a companion. Four Horsemen have revealed their second human figure for the Infinity Edition Outer Space Men. 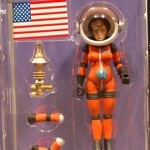 They have revealed the first newly design female astronaut Terra Firma. The figure comes with an American Flag, interchangeable arms and a classic sci-fi style ray gun.